Dette er version 1.1 af inverteren med arduino er beregnet til at blive brugt sammen med skrottede trafoer fra halogen lamper og andet elektronik. 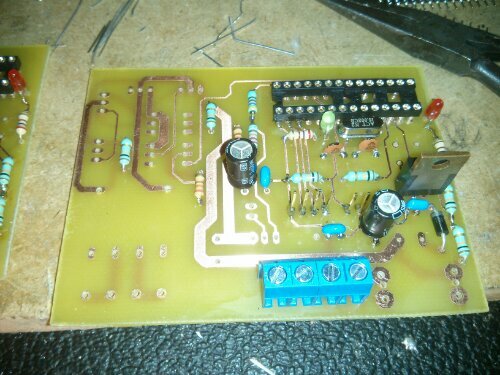 Det er en anden version af Inverter prototype v.1.0 PCB for trafoer med center input. Denne version har også optokoplere for sikkerhed og stabilitet og har desuden h-bridge trin i udgangen til at trække trafo. Der skal ikke bruges et arduino print, atmega328 med uno eller dueliminova bootloader er placeret direkte på printet og kan købes på ebay.co.uk med sokkel, krystal og kondensatorer for 35 kr. Det kan anbefales at eksperimentere med IRL mosfets istedet for IRF, idet IRL åbner helt ved 5 volt, det går IRF ikke, og der afsættes dermed mere varme. How do you deal with the interlock of top and bottom Mosfet ? From the power schematics it looks like you don´t even care about an interlock, does that work fine ? What are the values of the capacitors C1, C2, C3, C4, C7 and C8? What are the capacitor values C1 to C7? I want to do this as a DUI than buy an inverter. Thanks a lot. Thanks a lot, man. What about C8, R3 and R15? sorry for all the missing values, c8 is not critical, something like 330 uF to 1000 uf 25 volt or so. 1) The 4-pin wire-connectors at the input(12VDC) and output(220VAC). Why not just connect a 2-pin connector, as I can see from the schematics that you have shorted two pins together. 2) The transformer. Where did you get that one from? I am looking around to buy a used transformer from a microwave or other electrical appliance, as buying a new one is very expensive. Any suggestions? Once again, thanks a lot for all the information. Also, do you think I can get rid of the JP2 programmer pin if I already program the atmega168 using an Arduino Uno? Thanks a lot for your quick replies. I still have a few questions..
1) Why have you used 4-pin wire connectors at the input(12V) and output(240V), as I can see in the schematics that you have shorted two adjacent pins together. Won’t a 2pin connector do the job? 2) Any tips on choosing the transformer? What’s the difference between a small 12-220V transformer, and a big one like you have used? Is that dependent on the current? I aim to use this on a Solar panel that supplies around 21V(which I will limit to 12V) and about 3A current. What was the output waveform like, on an oscilloscope? Was it a pure sinewave? And did you have to use a capacitor at the transformer output, for filtering? 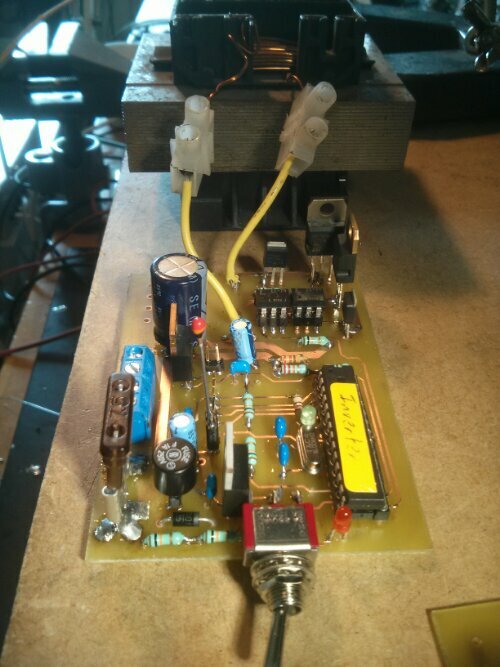 Finally tried the circuit… Everything works as expected, except that there is about 1.5V drop at the MOSFET. So two MOSFETs at any given cycle makes the overall voltage down from 12v to 9v (1.5+1.5 loss). Any suggestions on how to reduce this? Just curious – would it be possible to get Eagle schematics file? I’m interested in remaking this project a bit to reduce the size, this includes changing some parts to SMD and removing some parts. Could you, please, upload a full Eagle project archive? Also, I haven’t had measured it yet, but isn’t it like ATMega48/88 would fit just fine? hey, this is a really nice smd pcb you have made, it is also usefull for other applications than like dc motor controller, high power switching and more. Looking forward to se your blog about the Development process. You can use googles blogger.com, you can later move blogger blogs to you own domain. Hvilke 2 typer mosfet anbefaler du af IRL. Hvilke 2 typer bruger du selv ? jeg endte op med at bruge skraldede mosfets fra pc bundkort, atx strømforsyninger mm. Which is the maximum output power? I am looking to build an inverter to 1500w . What should I change in this project?